Eclipse 2017... we made it. We survived! Did you enjoy it wherever you were at? I never did find me those super hard to find eclipse glasses. Let me tell you, I'm already putting an order in for my glasses on Amazon for 2024.... especially because its coming right through Indiana!! YAHOO!!!! Ricky & I already said we were going to go to that. After talking with Julie, who lives in Nashville & experienced the full totality of it, & what she experienced, I want to see the same thing. & seeing all the live feeds online & when it actually went completely dark? I want to witness all that firsthand. By the way, how awesome is it we can watch live feeds of the whole thing on a computer, a tablet, the palm of your hand with your phone. Times, they have changed. & while sometimes it seems like its not for the good, technology is pretty awesome. Gotta give that one to passage of time. & no one in our office had a pair of the eclipse glasses. DANG IT. I saw pictures of people with their whole office sporting a pair. Our office just must be full of slackers. I dont feel so alone. I guess I'm with my people. 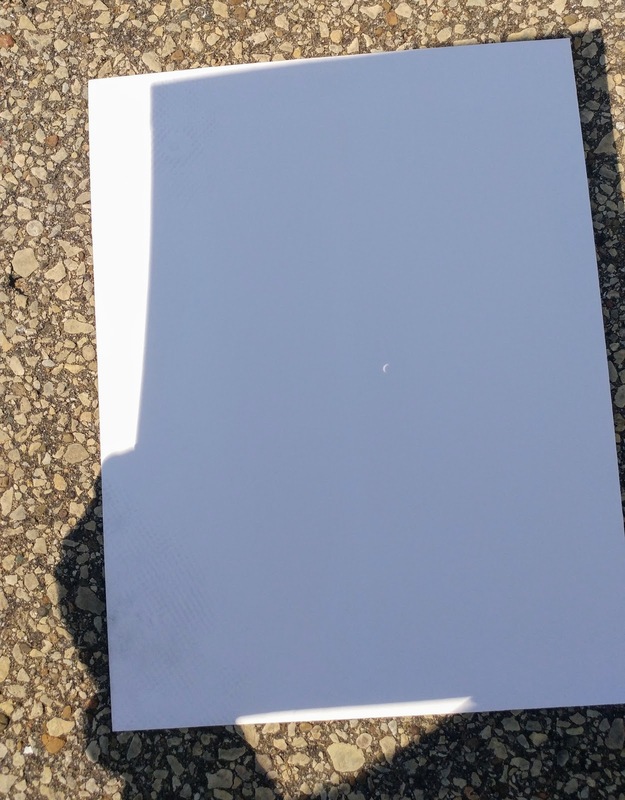 Luckily, one of my buddies had send me an email that she was doing the pin-hole trick in paper. I asked her how to do it - especially since I looked online & the only thing you can find are those box projectors .... & side note, they ALL recommended cereal boxes..... I literally just gagged typing that word. They need to come up with some other options for boxes next time. So Elizabeth gave me my instructions & I grabbed some big envelopes & punched a hole in it ... & it actually worked. I kept the sun to my back & got to watch a itty bitty, teeny weeny eclipse happening on the paper. A totally difference picture from the one above, huh? & we didnt get as much darkness as I expected - & we were at 96% coverage so I think I may have expected a little more - but it was still cool to be a part of. They asked a lady what she thought of it & she said, "I just never expected it to feel so emotional over it".... & I could totally understand that. It really is overwhelming to think of the mightiness that we all got to witness for just a passing few minutes. 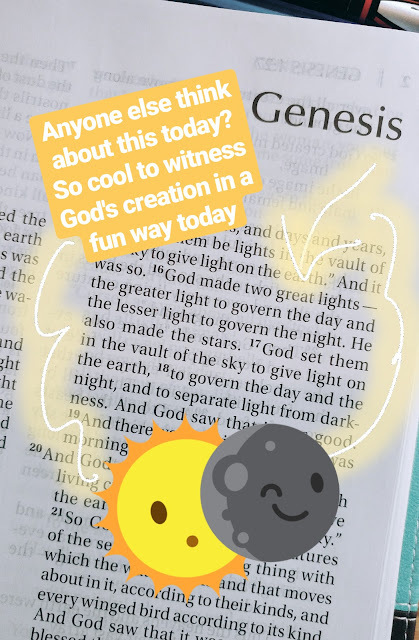 Because you see, just the day before, I was doing my Bible Study & in it, was referenced the "Creation Story"... the beginning of the world.... when God created everything, including the Sun & the Moon. & you think how long ago God spoke into being these things.... & how they all still turn & rotate... & bring such mystery & beauty & amazement to us in moments like this. Things we take for granted on most days. I mean, we dont have parties every day for the sun... & we love good moonlight evenings, but we dont drive for miles or make reservations years ahead to go see it. But when we see God's amazing works come together... we stop. We are in complete awe. .... & I thought of how nice it was to just see good news for a day. & seeing stadiums of people of all kinds together just sitting & watching this event.... people camping out together to have fun & celebrate.... kindness.... friendship... civility... a brotherly love. All to watch this amazing thing of these mighty creations coming together in a moment. Reminds me that when ALL of God's creation comes together, big things can happen. & if God's people continue to get together & share brotherly love, can you imagine all the awe that can hold? Can it make people stop & stare in wonder?... actually, I think it can. we are totally going to go to indiana in 2024 as well. better book a hotel now ;) jk. a guy at my work brought in a bunch of glasses, thank goodness. it was really, really cool! KC joined us at my work as his county closed schools for the day and all of my coworkers were asking him questions because he's a big science nerd and loved explaining it. i was just like ssh, let me look at the pretty thing! ha. very cool! I didn't realize people where actually making reservations to stay places or gathering in stadiums to see it. It honestly didn't look like a big deal here. It was just overcast and cloudy, and yes I did look without special glasses and i'm not blind (yet). But really, it was just clouds so I didn't think that was harmful. I did watch the Nasa live feed from SC and even text my friend to see if it got dark there and she said it was dark enough for the street lights to come one. It did for sure get super hot here afterwards though. Yay! I'm glad it worked for you! :) I saw some people wearing welding helmets, some looking through the c-boxes, some with larger paper boxes on their head, strangers sharing their glasses with random folks ... and all that just so the moon could photobomb the sun for a minute or two. ;) God's works are mighty and good! Side note - just checked the calendar for 2024 and April 8 is another Monday. 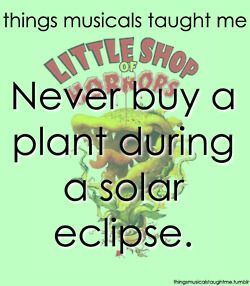 If total eclipses are what it takes to get through Mondays, we should have more of them! Loved this post, Rebecca Jo, and yes! I stood in complete awe of our creator yesterday! I never did get glasses either. Luckily, a few people in my building had some and were willing to share with those of us who didn't. We watched it in our parking lot, and it was cool to see everyone from other buildings on our street out in their parking lots and sidewalks hanging out to watch it too. We had a hotel in Cleveland TN to watch it, but we decided the traffic and all that wasn't worth it with Zoe. I am glad I got to see it outside, but was a little underwhelmed because I thought it was going to get a little darker than it did. We had 94% here. I did hear the nighttime bugs chirping though, and saw the crescents all over the ground. That was freaking cool! my hubs got glasses at his work (they gave them out!) and they all stood outside watching. we only got 75% coverage but he said it was really cool to watch. I watched the eclipse on CNN for Wyoming and it was sooooo cool. LA didn't experience much (I never bothered with glasses either) that was noticeable to the naked eye (no, I did not look at the sun!) and ours happened fairly early when it was also partly cloudy. Boo! I am continually amazed by God's works and yesterday was definitely one of those. My sister took a trip to Georgia to be in the path of totality. Thankfully I was able to score a pair of glasses yesterday morning because boy did you need them. I don't know what I was expecting yesterday, and I know we were pretty far out from it happening, but I guess I thought it would get a little darker than it was. It was still an amazing experience to witness and now I am set for 2024 with my glasses. I think I was too far north to see much, but I experienced the dim lighting (despite the sun) and my dogs started acting a little strangely! I should've tried the paper trick. I'll be more prepared for 2024. I, too, thought it was nice how our country came together for a bit to admire the sun. It was a unique and bonding experience. I'm glad it happened :) God is good. It was really a non-event here. Cloudy and it just got a little more overcast. Missed it, but am enjoying all the amazing photos! The live NASA feeds were AMAZING. We were only at 80% or so here but it was still pretty cool to see! Our office had glasses they were handing out, which was nice. 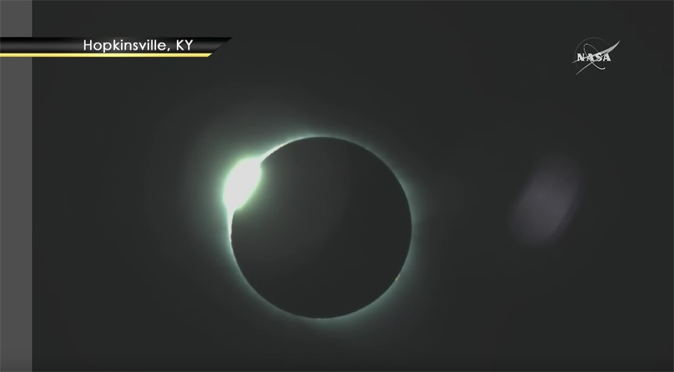 After seeing videos from friends that were in the area of the full eclipse, I think I'm really going to try to do that for 2024. It sounds amazing! Talk about the wonder and awe of God that it put into me and how I do take for granted these MASSIVE lights in the sky that God brings up every single day and night. I am so amazed at how often I make the evil doings of men so much bigger in my mind than the God of the Universe who created it all and who is bringing all things under Jesus' feet. I thought about that same thing, how God's creation, for one day, brought us all together for one common goal. He is amazing! !